The verdant Corfu, the mythical island of famous travelers and the last stop of Odysseus’ travel to Ithaca, is the most popular of the Ionian Islands but also one of the most beautiful islands not only of Greece but also of the Mediterranean Sea. In recent years it has evolved into an international tourist center, as the incomparable natural beauty of the monuments - products of her long and turbulent history, as also her infrastructure are able to satisfy the tastes and desires of even the most demanding visitors. Corfu’s beaches have great variety. You can find beaches with golden sand or colorful pebbles, rocks - sculptures exhibited at the most contemporary galleries, as also with trees which spread their shade to the water. Corfu is a natural beauty. Frequent and extensive rainfall favor the rich vegetation. The climate is mild, Mediterranean climate, with mild winters and cool summers. Walking in the Old City you can find two typical Venetian fortresses and many old churches - important architectural monuments. Apart from the Venetian monuments, τhere are many attractions that adorn the city as Spianada a beautiful square one of the most prominent features of Corfu, the church's patron Saint Spyridon, the graves of Capodistrias and militant revolution Fotos Tzavela, the point where there was the grave of our National Poet Dionysios Solomos and the palace of Achilles, which takes its name from the statue of Achilles which is dying in it’s garden. In the middle of summer, the narrow streets of the city, the alleys are full of tourists coming from each part of the world, but there is always for the visitor a quiet place in the smaller streets and shady squares, to rest and enjoy a refreshing ginger beer. In the maze of alleyways, the visitor discovers the workshops of silversmiths and wood carvings. 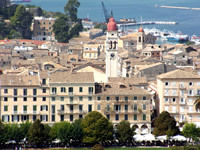 The famous "LISTON" as also some sections of the city and the surrounding area of ​​the Municipality of Corfu are modern, but there are also many buildings of Venetian, French and English impact. Palaces, forts, museums, libraries, galleries, churches, interesting public buildings and private mansions, public and private archaeological sites, areas of outstanding natural beauty and special interest, traditional villages, lush groves, picturesque ports and blue-green beaches make an unexpected puzzle in Municipality of Corfu, which leaves each visitor speechless. After the tour, visitors can taste the local cuisine in one of the many traditional taverns that exist in the city. Famous dishes of Corfu are sofrito, pastitsada and mpourdeto. The visitor can also get a feature of island souvenirs, (shops during summer stay open until late at night). 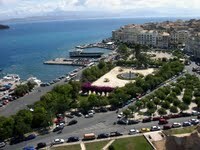 The tour will conclude with a visit to the famous bars of Corfu for an overnight spree. In Classical times, Corfu played a major role in history-making when its quarrel with Corinth, whose colony Corfu was, drew in first Athens and then Sparta, Corinth's ally, and led to the 27-year Peloponnesian War, immortalized by Thucededes. 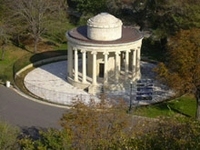 The war resulted in Athens' demise and marked the beginning of the end of Greece's glorious Classical period. 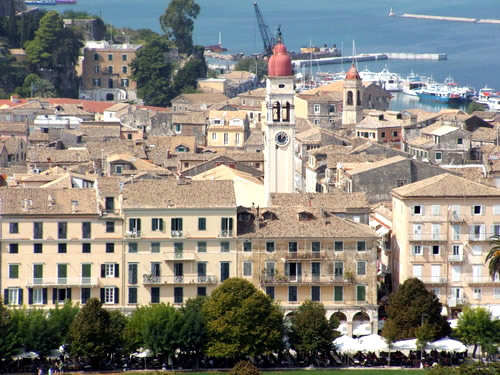 The history of Corfu after the Peloponnesian War was of Roman conquest and raids by the many barbaric tribes that descended on the Balkans at the dawn of the middle ages. Between 1204 and 1576 the island withstood two devastating attempts by the Ottoman Turks to bring it into the Imperial fold, a number of rebellions against invading Crusaders, and a number of bloody raids by wandering pirates. Finally, in 1576, after more than half of the population had been killed in the previous few decades, the Corfiots sought Venice's patronage and protection. Venetian rule, as in Zakynthos, meant vigorous economic activity, rebuilding of the cities, and especially Corfu Town, and the establishment of a new class of nobility, the members of the Gilded Book, or the Libro d' Oro. Thus, the island withstood more Turkish attempts, and only fell to the French during the Napoleonic wars. The French rule is marked by a number of great buildings, including those lining Liston street. Majesty's subjects living permanently on Corfu, and the presence of Brits in the northern part of the island is so dominant that Kassiopi is called affectionately Kensingto n-on-the-Ionian. 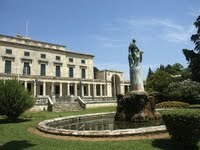 Among the famous foreigners that have, at one time or another, found love, inspiration, or refuge in Corfu are the family of Laurence Durrell, Queen Elizabeth, also known as Sissy, of Austro-Hungary, who built the Achilleion, and Kaiser Wilhelm II of Prussia, who bought it after Sissy's assasination by an Italian anarchist. 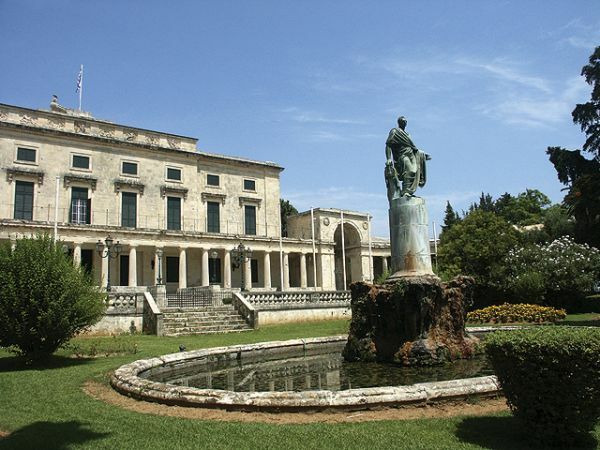 In 1864, Corfu, along with the rest of the Ionians, was given to Greece as a gift by Queen Victoria to the newly enthroned and Danish-born King George I. Since then, the island has seen two of its sons become Prime Ministers and various others playing key roles in the country's political, cultural, and social life. Corfiots, especially the descendants of the aristocracy created by Venetian edict, are very elegant and pleasant people, always well appointed and well spoken, and always ready to tell a joke and crack up in roaring laughter.